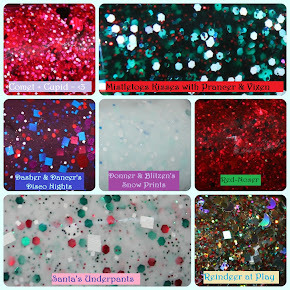 See Sarah Swatch: Guest Post from Marisa of Polish Obsession! I know Sarah is a glitter lover and so am I. So I knew my mani had to have something with glitter in it ;0). I decided to wear a recent release from The Hungry Asian, Mint Condition. 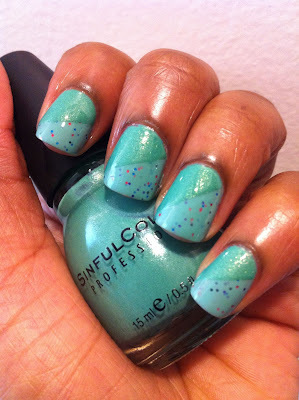 Mint Condition is a beautiful mint green creme with red and blue microglitter. So gorgeous!! I then decided to tape have the nail diagonally with Sinful Colors Mint Apple, another one of my favorite mint green polishes. I used Growth Spurt as a base and Seche Vite Fast Dry Top Coat. I decided to leave my thumb with just Mint Condition as an accent nail. I really loved the way this manicure turned out. Such a fun look! Thanks again for having me as a guest Sarah! Hope you're having a blast ;0). Yay Marisa! This is lovely! I have to say I think I am in love with mint condition! It's such an awesome polish! What an amazing mani! I am loving these minty shades on Marisa! Thanks so much Chelsea! Glad you like it ;0). Such an adorable manicure! I love the combination--subtle contrast but still very cool and eye-catching--and the accent thumb is an awesome touch. I love it!